Not literally. We’re introduced to the world of Assassin’s Creed through an overheating and glitched-out Animus, a machine used to isolate and experience genetic memories. We play the tutorial, learning how to jump around on buildings and move through the world of the game, all surrounded by faceless, fawning semihumans. Things get stranger; we wake up. We no longer control our unnamed hooded figure. We’re Desmond Miles, mild-mannered bartender, sitting up on the Animus machine listening to a monomaniacal doctor and his technician explain things to us. Maybe now, and if not now then certainly later, you pick up that their names are Warren Vidic and Lucy Stillman. The first is a Templar who needs Desmond to experience the life of his ancestor, Altair, in order to reveal the location of a device that can be used to control the world; the second is an Assassin sleeper agent who is doing everything in her power to stop the Templars. The meat of the game isn’t here, though, at this top level that is constantly more complicated the more games that are added to the series. It is instead one level deeper, in the Animus, in the past. As I said at the beginning, Assassin’s Creed‘s focal point is around the creed itself: “nothing is true, everything is permitted.” We’re introduced to Altair through his inability to understand this phrase — on a mission to protect an artifact, he shows that he does not understand, putting himself and his brotherhood in danger. How someone who lacks the most basic understanding of the central tenets of an organization is able to not only rise but become a minor master in that organization is left unanswered, but because of this initial folly, Altair is demoted down to the lowest level of assassin by his commander, Al Mualim. 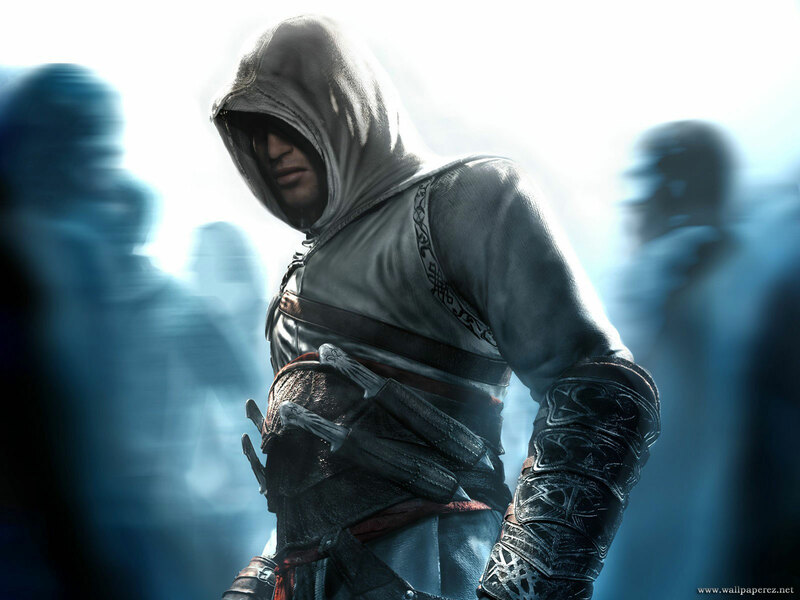 In order to be forgiven by his order, Altair must assassinate nine targets throughout the Holy Land during the Crusades, restoring a semblance of peace during the brutal Crusades. We’re moving through this very intricate set of details from the beginning of the game because they function in much the same way as a prophecy would in a traditional role playing game. It contextualizes the events that are about to occur, but it also assures us that the compartmentalized events we’re about to experience for the next fifteen hours are all in service to a single, golden plot thread. Much of the rest of the game is split into chunks of memories that work in scenario format: Altair goes to a city, does some recon work, and gets the go-ahead to assassinate one of the nine targets. After jumping through some hoops, we do the job, and Altair receives a small piece of a very grand puzzle in the form of a long monologue from his target. We travel back to the Assassins’ fortress, Al Mualim contextualizes what just occurred, and Altair proves that he has grasped another part of the Creed more explicitly. That is the ebb and flow of the game’s narrative, with each wave being the targeted assassinations themselves. The real struggle of the game is presented here — with each assassination, Altair learns more of the order that exists in opposition to his own, the Templars. From the outset, the Templar targets you assassinate call into question how their deaths could be considered just: “Why me, when so many others do the same?” asks the first, and there is no answer. The lesson that is drilled into our heads over and over again throughout the game, almost to the point of ridiculousness, is that the Templars and the Assassins are much the same, with the only difference being the methodology that each groups deploys. Late in the game, it is revealed to us through several different encounters that this difference in methodology can be easily summed up as “Assassins want freedom, Templars want slavery.” Both claim that their plans will lead to the eternal peace that humans deserve, and both assume a genocidal stance toward the beliefs of the other. We are told by parties from both camps that “it only takes one” to continue the ideology of the Assassins or the Templars (a fact that is taken to its extreme with the development of the Animus technology which “reads” genetic memory). While the paths of Templars and Assassins are given to us as equal in a number of ways, including an equivalence in the kinds of violence that both have to commit in order to facilitate their plans, there is still a clear line drawn for us near the completion of the game. Al Mualim: Who you are and what you do are twined too tight together.To rob you of one would have deprived me of the other. And those Templars had to die. [sighs] But the truth, is I did try, in my study, when I showed you the treasure. But you are not like the others. You saw through the illusion. Al Mualim: That’s all it’s ever done, this Templar treasure, this Piece of Eden, this word of God. Do you understand now? The Red Sea was never parted, water never turned to wine. It was not the machinations of Ares that spawned the Trojan War, but this! Illusions! All of them! Altair: What you plan is no less an illusion–to force men to follow you against their will! Al Mualim: Is it any less real than the phantoms the Saracens and Crusaders follow now? Those… craven gods who retreat from this world that men might slaughter one another in their names? They live amongst an illusion already. I’m simply giving them another, one that demands less blood. Altair: At least they choose these phantoms. Al Mualim: Oh do they? Aside from the occasional convert or heretic? Al Mualim: Ahh. And now logic has left you. In its place you embrace emotion. I am disappointed. Altair: What’s to be done then? Al Mualim: You will not follow me, and I cannot compel you. Altair: And you refuse to give up this evil scheme! Al Mualim: Seems then that we are at an impasse. There are two things that are happening here. The first is that Altair, and therefore the order of Assassins that follows him through history (and the next games), is the embodiment of a pure classical liberal worldview. Choice and free will are the most important values possible, and even if those values are put in the charge of something that betrays them — Al Mualim’s “phantoms” — what matters is not that they were compelled but that they had an option to be compelled. The Assassins are therefore the culmination of the core values of the Western canon of philosophy and political theory, which I need to point out is a canon that has been thoroughly critiqued for its focus on and valorization of increasingly atomized agents who are praised for being unique and singular but only taken seriously when they are in a mass. The second, maybe more important, argument of the fiction of Assassin’s Creed is that the only way for this impasse between two worldviews to be crossed is through violence. This solution, which ends the game, is a moment where we have to scratch our heads. How is it that a game with a fairly sophisticated sense of a morally grey political ecology falls prey to what it essentially a “clash of civilizations”-style argument for the incommensurability of two different worldviews when they come to different conclusions about the same set of facts? It is an open question. There’s no solution to it, partially because Assassin’s Creed purposefully leaves us with no ground at the end of the game. It ends abruptly, with the Templars of the contemporary era using the information from Desmond’s memories to find the Pieces of Eden in the present day. The game ends with symbols in blood on the walls, an open wound with no resolution, waiting for a sequel. Tensions between worldviews and narrative structures are eased, solved, and complicated further by additional games in the series (which I will hopefully get to soon). But there’s an alternative history, one where this game flopped and the franchise never became a franchise. What does it leave us with? A fictional world internally debating with itself for fourteen hours, the fifteenth existing only as a quick and convenient blade for asserting a tired political lesson that became tired a century ago? Something more? Something less? This entry was posted in Assassin's Creed, Video Games and tagged assassin's creed, narrative, video games. Bookmark the permalink.